There are 28 posts filed in Sempre Vitória (this is page 1 of 3). At the end of January we were sitting 2nd in the league and in a title battle with Benfica and Porto, os novos Três Grandes. A poor run had seen a resurgent Sporting fall away while AVB’s Braga are still plugging away and are never too far behind. We slipped up in the final weeks of the season last time out, could we go one better than our 2nd place finish and win the league? 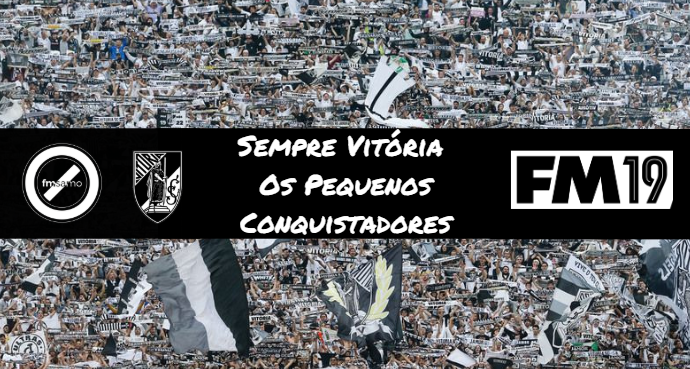 As I move into the business end of my fourth season in charge of Vitória, I had a thought that I’ve been pretty lax at sharing and showing off some of the promising young players at the club. A few were mentioned in the Vitória development pathway post but I’ve usually waited until they’ve made it to the first team as in my head this is when they’ve merited their chance to be shown off. However, I’m now throwing that out of the window and would like to introduce you to a selection of Os Pequenos Conquistadores, the little conquerors. We’ve reached the point of the season where the games come thick and fast. There’s eight to play in December and then a potential seven in January. Recovery days will be essential for the squad. There’s only one pre-arranged piece of first team transfer business to go through and right now I’ve no firm plans to dive in and spend our, just topped up by the board, £18m transfer budget. That could change though if the right player became available. That felt like the longest break between seasons. It’s time to finally get competitive match action underway for my fourth season in charge of Vitória. How would we cope juggling the Champions League group stage with trying to start well in the league and progressing in the domestic cups? Read on to find out. Season three turned out to be our best one yet. We challenged for the Primeira Liga title, but ultimately fell short as Benfica picked up their first league win of the save so far. I did manage to win the first two trophies of my time at the club though, bringing the Taca da Liga and Taca de Portugal to Guimarães. A few weeks back, we did an episode of the OneMoreGame podcast on how we utilised the other squads available to us at our clubs. My chat was specifically focused around the B team that Vitória has and how I use that squad in the player pathway to the first team. This post will be going through that plus obviously some mentions for a few of the young players coming through in our intakes too. On the face of it my third season at the helm of Vitória went very, very well. We finished 2nd in the Primeira Liga and won both the Taca da Liga and Taca de Portugal. However, it could have been a domestic treble. Going into the final five matches of the league season we led the way to then lose our next two and hand Benfica the title. Some would say “bottle job”, I’d agree but I’m not disheartened. It was a good season all things considered and here’s the tale of it in stat form. We go into the business end of the season with a trophy in the cabinet and on our best run of form since I took over at the club. In the last update we won the Taca de Liga (my first trophy at the club, and the club’s first ever time winning this cup) and went unbeaten in January. We currently sit 3rd in the league, not far behind Os Dois Grandes, Porto and Benfica. A title race was mentioned last time round, we surely couldn’t win the league, could we? After a shaky start to season three with Vitória we then went on a 10 match unbeaten run in all competitions which took us into the Europa League qualifying spots in the league and into the knockout round of that competition this season. We’re in pole position to qualify for the Taca da Liga semi final for the third season running and have a Taca de Portugal 5th round tie to negotiate in the coming month. Read on to see what happened over the festive period of the season. Last time out I went through our ins, outs and expectations ahead of season three kicking off. Give that a quick read if you missed it. This post will take you through the first four months of the season. Let’s go. Get the latest post straight to your email by signing up here.